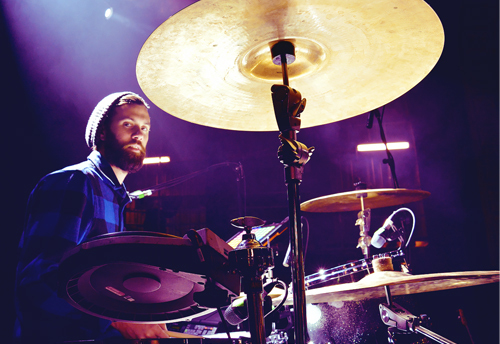 "If you said playing drums was all about feeling you'd only be half right. The other half of the battle is tone, and Yamaha drums deliver great tone. I've played at least 100 shows over the past year, from tiny clubs to Glastonbury, mostly on the fantastic Yamaha Oak Custom and more recently on a beautiful Yamaha Maple Absolute Custom. Both kits cut through the mix, with body and sustain where I need it, across a wide range of tunings. Yamaha drums allow me to concentrate on my playing, knowing that my kit sounds great out the front every night." While Toby had a pair of sticks in hand from a young age, it was not until his late teens that he got bitten by the drumming bug. With hip hop and drum and bass bringing as much influence as rock, he taught himself to play along to his favourite tracks and soon began keeping time in bands. Fast forward to 2004 and Toby met Dougy Mandagi and they started jamming together on the songs that would become the Temper Trap's EP. While Triple J got behind the band with 'My Sun' on high rotation, the next few years saw the band retreat as they expanded their sound and began working on tracks that would become the 2009 album 'Conditions'. Toby's use of samples and programmed beats to compliment his acoustic kit formed a strong rhythmic backbone for the band. The album went on to gather four ARIA nominations in 2009, while the band hit the road, touring constantly around the world, playing festivals like Glastonbury, Summersonic and Coachella and selling out headline shows. It's still early days for the band but Toby is proud to become part of the Yamaha family.